Listen to the stories about 20 topics relating to the marsh, narrated by people who love the marsh and know a lot about it. Read the signs originally installed, when the Class of 1918 Marsh was dedicated in 1972. These signs, with illustrative drawings, were created by James. 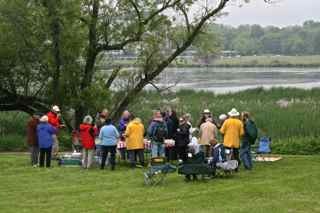 H. Zimmermann of the Nelson Institute (then Institute for Environmental Studies) and UW Arboretum naturalists. 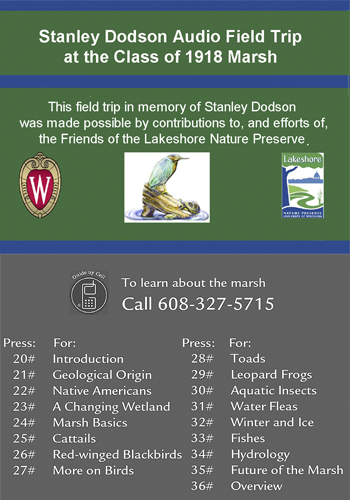 The sound tracks for the Stanley Dodson audio field trip at the Class of 1918 Marsh were developed by the Friends of the Lakeshore Nature Preserve in close collaboration with the Staff of the Preserve. 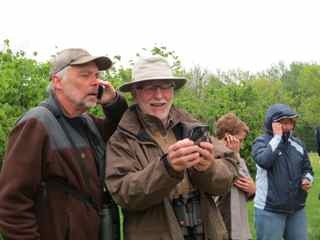 John Magnuson, Emeritus Professor of Zoology and Limnology led the project, and 13 knowledgeable volunteers wrote and edited the stories and messages; Brenna Jones volunteered her voice and Rob Haggar of Haggar Audio Productions donated his time and facilities for the recordings. 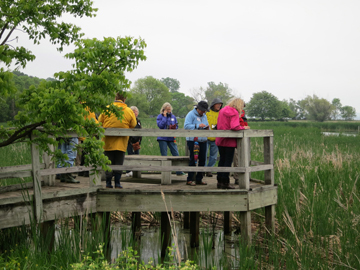 The project is one of the ways that the Lakeshore Nature Preserve and its friends bring nature to the campus and the community.